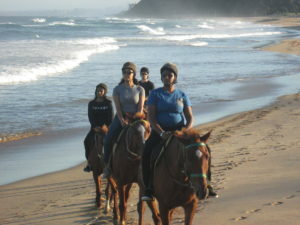 If you know how to ride, you might enjoy thrilling gallops down the beach. If you are a novice rider, you can enjoy a gentle stroll with waves lapping at your horse’s feet. Our 12km trail winds through a gorgeous bush route, along a short section of road and onto the amazing Reunion Beach. This diverse trail will take you to fun and exciting, yet totally safe places that you never knew existed in Durban. Info: This option is unique to Horse Beach Rides, you get to enjoy a fabulous beach & bush ride with the addition of a 45-60 minute break at the beach. 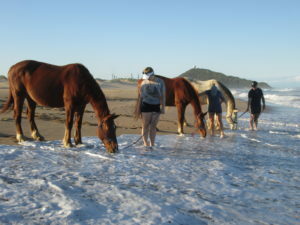 During the break we take the saddles off the horses and you get to take them for a roll in the sand and to splash around in the waves. Then while your guides are prepping the horses for the ride home, you get to enjoy light refreshments of fruit juice, water, and chips. 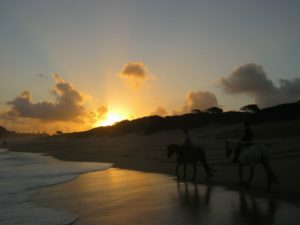 Info: This option is well suited to couples and groups celebrating a special event, you get to enjoy a fabulous beach & bush ride with the addition of a 45-60 minute break at the beach. When you climb off for your break at the beach, you are given a Picnic Basket filled with delectable foods and a blanket to sit on, so you can go pick a spot to enjoy your meal. After which you hop back onto your horses and head back along the trail to the farm. Please note, the Beach Only Ride is only available in the following options. 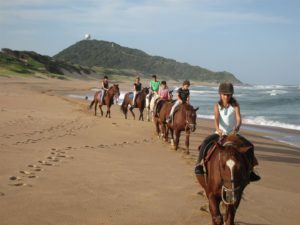 Please bear in mind, HORSEBACK BEACH ADVENTURES has a strict weight limit policy of 80kgs for Beach rides and 85kgs for Bush Trails. This is a non-negotiable policy.